Situated just a few steps from the Fox River and its biking/hiking trail Mariner Motel offers free WiFi access and guest rooms with a river view. Lambeau Field is an 8-minute drive away. All rooms are air conditioned carpeted and equipped with a desk a closet and an en suite bathroom with free toiletries. Linens and towels are also provided. Guests at Motel Mariner can barbecue out on the yard enjoy a cold drink at the bar or rent a bicycle to explore the area. An array of activities can be enjoyed on site or in the surroundings including fishing. Bay Beach Amusement Park is a 12-minute drive away while National Railroad Museum is a quick 5-minute drive away. 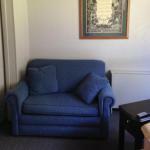 Resch Centre can also be accessed within a 10-minute drive from the motel.